Everyone who paid attention gets a $135 Pen! AU don’t get serifs. 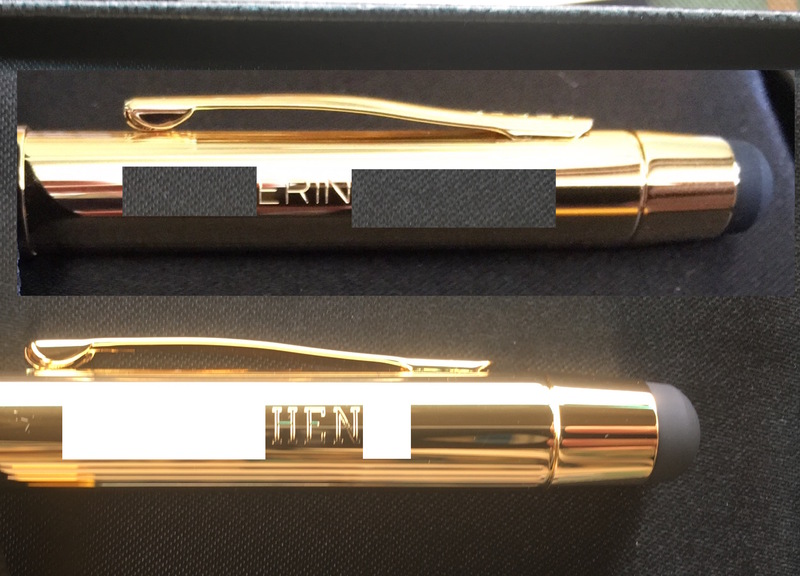 Congrats to the most loyal of Derp Report readers who finally received their 23k gold pens in the 2nd batch sent June 01, 2015. It has been a whole month of shipping via UPS Mail Innovations, and if you got your card after February 2016, but before April 2016 you should receive it today. So thank you for your not asking for advice and not acting on it. Thank you kindly for not wasting my time to explain something to you, and you just let the deal expire, good for you! You all finally got rewarded with a very loud pen that you would never buy in your right mind. Thank you for taking time to read and jump on this post I made months ago. Now my Authorized User (pictured above) has her pen engraved in a modern Sans Serif font. Meanwhile mine pictured below is in collegiate font. Could this be a way to distinguish the $995 primary user from the $295 AU? Does $700 buy you serifs? Or does it mean I have too much free time? If I see you out there with your ostentatious pen, I’m going to check the font and ask Primary User or lame AU. I think I need a better hobby.